We’re celebrating our anniversary – Sakugabooru’s fourth and this blog’s first – with some huge news about our future! 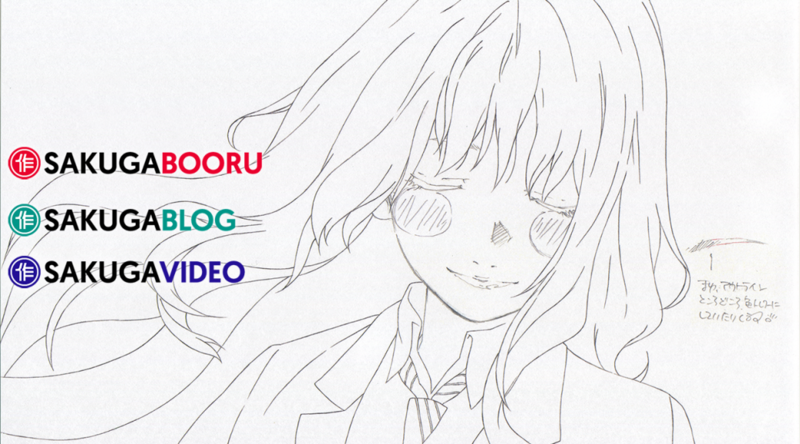 Sakuga Video: We’re launching our own Youtube channel! This is obviously the biggest news and the part that took the most effort. The idea is to make some relatively short videos (3 to 10 minutes) with a lighthearted educational tone, exploiting the video format to visually showcase someone’s work. For now we’ve produced a couple of videos for a mini-series focusing on the most important anime character designers of today as a trial. More on this later. Sakuga Chat: Not actually a dating service. People had requested some sort of casual discussion about the kind of industry and production matters we write about, so we spent a long time considering the best format possible. We didn’t feel a podcast would really fit as we’ll still be talking about many visual aspects, but if it’s written then we can easily keep inserting relevant clips. We’ve taken some feedback over the tone and level of editing (as natural as possible but properly formated), but we’re obviously still open to any suggestions you might have. The idea is to have at least one of these roundtalks a month, possibly bringing relevant guests now and then. Sakuga Interviews: Not so much a new thing, but something we’ll try to focus more in the future. We already published an original interview with Bahi JD, and we’ve got another very exciting creator coming up – even their studio agreed to work with us! Anime creators are always immensely busy so there are multiple directors and animators that haven’t found the time to do this even after having agreed to this, so we’ll just have to keep on pushing! Look forward to hearing more first-hand comments on the craft of anime. More Stuff: There’s a series of miscellaneous but nonetheless important news. For starters, we’ve got a new, more cohesive visual brand for all our sites. As we kept on expanding, that felt more necessary. Hopefully now everyone will be able to tell any piece of content is part of the same network at a glance. And while we’re talking about technical changes, planning for a Sakugabooru renewal is in the works. No promises in this regard since the system is functional as it is and this entails a massive amount of work, but we’d like something that is genuinely built for your needs. Will we be able to do all of this on top of the existing regular content? Yes, but not without your help. This is a daunting workload, and straight up increases our monetary costs as well. And so we’ve set a new Patreon goal to be able to justify what would be, at least personally, basically a full-time job at this point. The Sakuga Video service in particular is a big deal, as you can imagine. We’ve had to hire new people, like the mysterious celebrity bitmap who’s done all the new graphic design work and even voiced the first Sakuga Video piece. While the other new initiatives we could more or less deal with, that’s absolutely unsustainable as it is. And so we’ve produced a couple of videos, with perhaps a third following them up, to test the waters. If we reach the Patreon goal we’ll carry on, but otherwise we sadly might have to drop that platform. So please, support us as much as you can! Thanks to everyone who already has been doing so, you’re the ones who have made it possible for us to reach this anniversary in the first place. Curious what kind of “renewal” would be taking place with the booru if that ends up happening. Are you thinking about moving entirely away from the danbooru platform, or whatever? Our relationship with the moeboruu software the site runs on is outright hatred, somehow tolerated because It Just Works. There are many potential improvements we’ve been talking about but I’d rather not say too much! It’s like seeing your child age, I’m happy but suddenly I feel so old. A number of baseball blogs do livechats using JotCast. I know it allows youtube videos and images as well allows questions to be queued for you to curate. I think it’s a decent format for questions that need less research/text than the current Q&A posts. I believe they can also transfer the chats into a blog post as well. JotCast seems pretty pricey though, so if you do go that route, it may be better to look for an alternative.